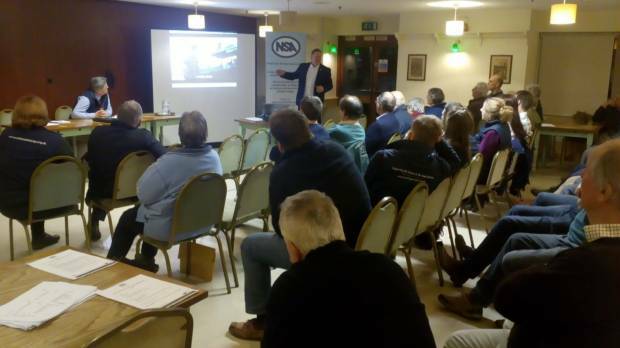 Tuesday the 19th February saw a well attended South West Annual Regional Members Meeting held at the Exeter Livestock Centre. The formal business of the evening was completed swiftly with Peter Derryman, Howard Tratt and Pete Delbridge reconfirmed as regional Chairman, Vice-chairman and Trustee representative respectively, the regional committee was also reconfirmed en masse. This was followed by a short presentation made to Joseph Keating who is being replaced as our AHDB representative by Leah Shanks as he has moved on to greater things within AHDB as Senior Knowledge Exchange Manager. Bryan thanked Joseph for his hard work, knowledge and significant engagement with the south west region during his tenure particularly around the often robust discussions held within the committee around AHDB's structure, role, focus and funding. We welcome Leah to the role and look forward to continuing the close relationship. Once the administrative business was completed the members were treated to 2 very interesting presentations by Eleanor Phipps, NSA Communications Officer and Kevin Harrison, NSA English Committee Chairman and Farm Manager for JTBaylis Farming. Ellie provided us with a comprehensive run-down of the work that the NSA has been involved in on our behalves in the policy arena, focusing particularly on the progress Government is making with both Brexit and the Agricultural Bill, and what the potential impacts both of these may have on the sheep industry. Kevin followed this with an entertaining and informative presentation on the visits he has made to China on behalf of the NSA, it was great to get a feel for some of the mega-farms they have there and a glimpse of some potential opportunities for the future. The evening was rounded off with a great buffet supper laid on by the Stockman's restaurant at Exeter Market. NSA South West Region would like to thank the Ellie and Kevin, and all those who were able to attend for making this a very enjoyable evening.